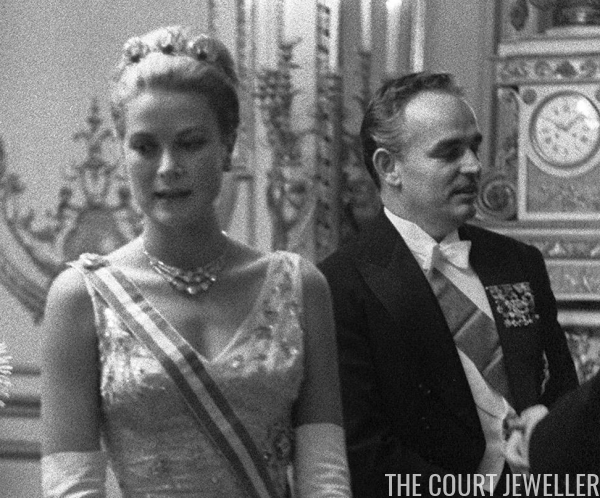 We often wistfully long for the day that Princess Charlene and her sisters-in-law will wear more of the jewelry that belonged to our Magpie of the Month, Princess Grace. 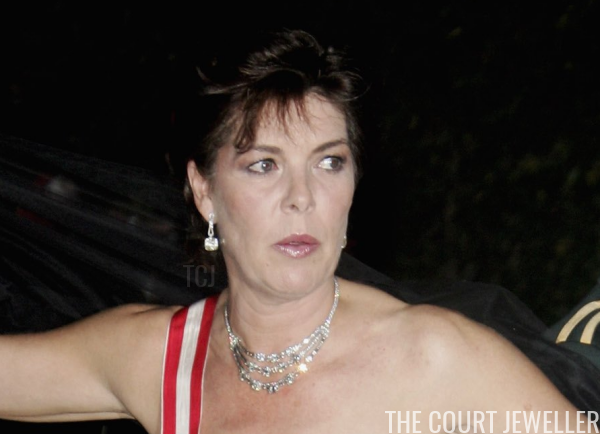 But one of Grace's magnificent jewels has had an outing in recent memory: her Diamond Festoon Necklace. 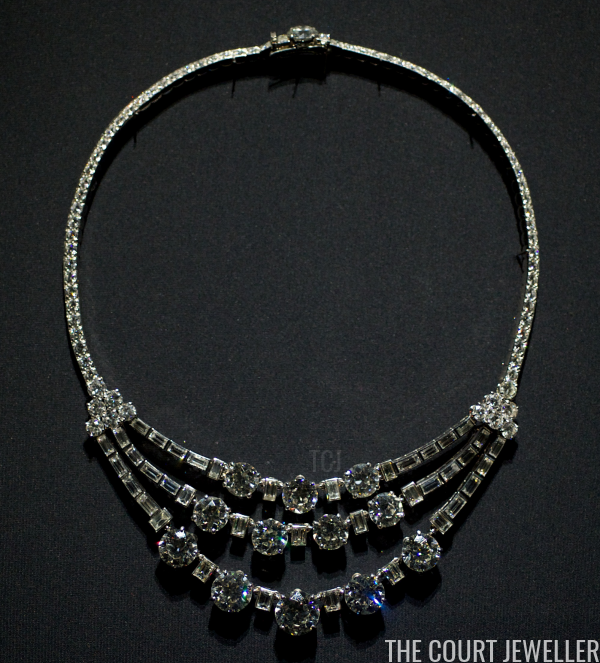 The necklace, shown here during an exhibition in Antwerp in 2008, was one of Grace's glittering wedding gifts in 1956. Made by Cartier, the piece features both round and baguette diamonds in its mid-century design. 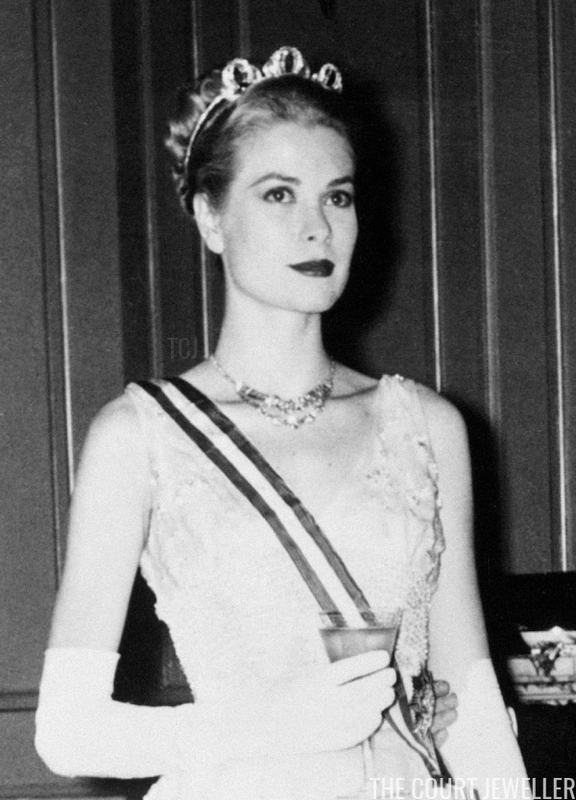 Grace wore the necklace for the first time in public on the night before her religious wedding in April 1956. For the opera gala held that evening, she paired the necklace with another wedding gift, the Bains de Mer Tiara. In October 1959, she chose the same combination of jewels for a dinner at the Elysee Palace in Paris. 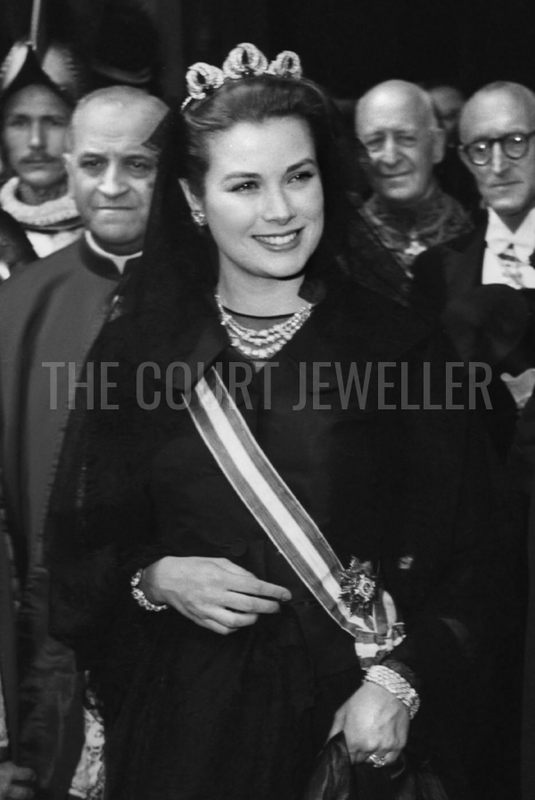 The diamonds of the necklace popped beautifully against Grace's black ensemble for her private audience with Pope Pius XII at the Vatican in April 1957. 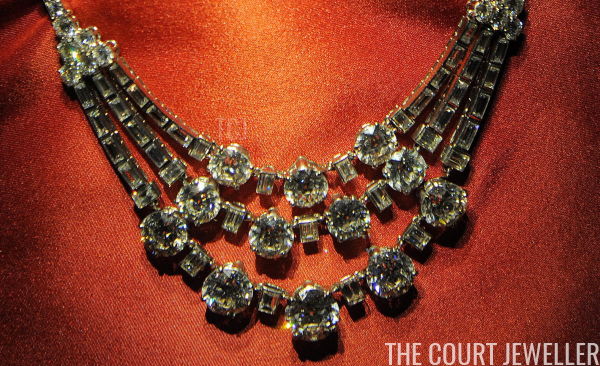 In recent years, the necklace has been among the jewels frequently exhibited from the late princess's collection. Above, the piece is included in a 2012 exhibition of Cartier jewels at the Thyssen Bornemisza Museum in Madrid. 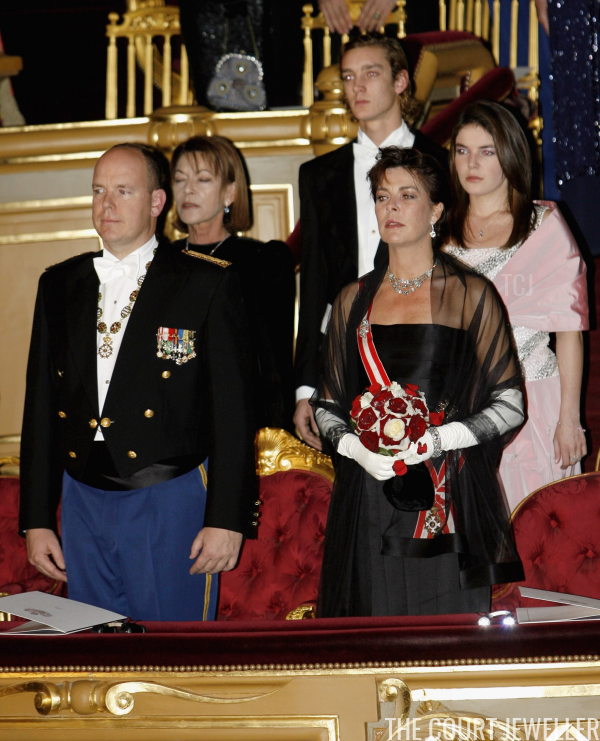 But in 2006, the necklace was worn once more in public by a Grimaldi family member. 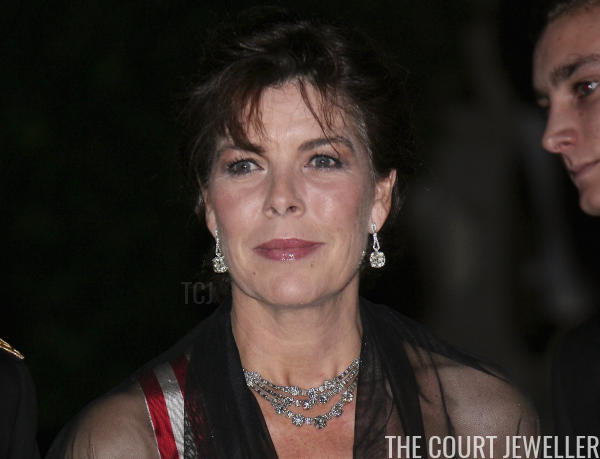 Grace's eldest child, Princess Caroline, wore her mother's diamond festoon necklace that November for the annual National Day gala at the opera in Monte-Carlo. As Caroline adjusted her shawl when arriving for the gala, we got a good look at the entire necklace. Here's hoping that we see Caroline, Charlene, or Stephanie wearing the necklace again at some point in the future!